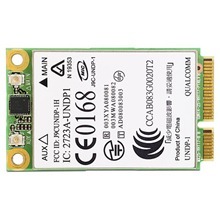 The HP un2420 EV-DO/HSPA Mobile Broadband Module is a WWAN module for select HP notebooks that, after installation, provides connection to and permits roaming on wireless networks in many countries worldwide. Multi-mode broadband solution that can support both GSM & CDMA networks, allowing you to choose the service provider that works best for you. Connect easily with preloaded HP Connection Manager software. This driver installer package contains the Qualcomm Gobi2000 Drivers for the HP un2420 Mobile Broadband Module in supported notebook models that are running a supported operating system. Released: 2010-09-24, Version: 1.1.180.0, Support Windows XP, Vista 32bit/64bit, Windows 7 32bit/64bit. - An HP notebook with a supported, embedded, mobile broadband module is required. - Power to the mobile broadband module must be ON (if using this package with HP System Software Manager).